I have developed an TTS Server that I call Mac2Speech. 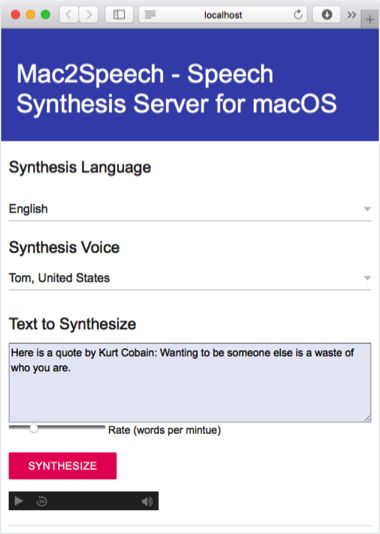 Mac2Speech is a Speech Synthesis Server for OS X and macOS Sierra, allowing you to use your Mac as a Text-To-Speech server, converting text strings into MP3 voice sound files on the fly. You can request an mp3 sound file by either sending an HTTP GET request like: http://localhost:8080/tts?text=Hello World which would stream an MP3 back in return or send an HTTP POST request and receive a path to the mp3 file back, ready to be downloaded once or multiple times. The TTSServer does not have a native UI but can be accessed through a Web Browser. Wow. This is a great way to have a high quality TTS. Very creative use of the Mac and its great TTS functionality. Been running the application since purchase (on a virtuale machine based on Mac Pro) Using it in KNX homeautomation system. I must just say, I’m very very happy, it’s great! And most of all extremely stable! This could easily be used in a Commercial KNX system! Thank you for this great application, will recommend to purchase this application to all! The display is the canvas and your finger becomes a paint brush. Simply use your finger to create beautiful paintings. Use the Menu to change color or brush styles and also to print or share your artwork via Email, and publish your best work on our flickr group, straight from the app. Mobile applications like Artist on Android, are perfectly suited to accept voice input. Instead of accessing the menu several times, to select a tool (like a pen or a brush), its style (like embossed or blurred), and its color, you now press the microphone button in the Actionbar and say “Lavender Blur Pen”. 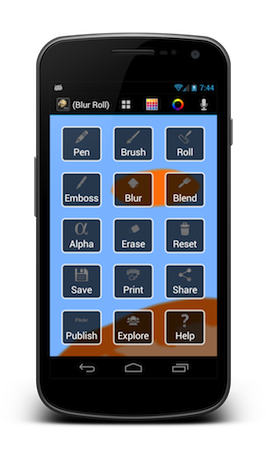 The application’s vocabulary include all menu topics like “Pen, Brush, Roll, Emboss, Blur, Blend, Alpha, Erase, Reset, Save, Print, Share Publish, Explore, and Help” and also over one hundred color names. To bring up a list of all those color names, simply say “Colors”. Read more about Artist on Android, which is also available on Google Play. Brilliant! The voice command was a very unique touch. So I clicked the button; I said the color I wanted and it switched me to the color I said. In January 2003, I founded the Swixml open source project to combine the benefits of Swing (availability of models, extensibility of widgets etc.) with the lean XUL-approach, demonstrated by the Thinlet developers. SwiXML, is a small GUI generating engine for Java applications. Graphical User Interfaces are described in XML documents that are parsed and rendered into javax.swing objects at runtime. Sun Microsystems’ CTO once called it “The strongest straightforward design of declarative GUI implementations”. Last I checked, SwiXML was the best “XUL motor” available for Java. Rather than try and port Mozilla XUL (as the Luxor project has done), SwiXML has created an XML vocabulary that will be much more natural for Swing developers. So, if you’re looking for a way to define your Swing UI’s in XML, SwiXML is one of the best choices around.